Samoa have named their 30-man squad for the World Cup and have their eyes firmly set on causing more upsets. While the form guide may suggest South Africa and Wales are the favourites to reach the knockout stages from Pool D, Samoa will fancy their chances of repeating the upsets of 1991 and 1999, when they beat the Welsh. Wales and South Africa will certainly not underestimate the danger of the Samoans, especially after the Islanders stunned the Wallabies in Sydney last month with their physical style and desire to succeed. A standout performer that day was Alesana Tuilagi, one of five brothers to have played international rugby - all for Samoa bar the youngest Manu who is England's World Cup squad, who will be a threat with his size and pace. Samoa also have strategists such as Seilala Mapusua, bound for Japan after the World Cup but until recently a key member of London Irish's midfield. If he needs some help to plot defensive strategy, he can always turn to fellow centre, Gloucester's Eliota Fuimaono-Sapolu , who was a practising lawyer before turning professional. Second-row Daniel Leo is another with experience of England's top flight from his time with Wasps, while Toulouse prop Census Johnston, previously with Saracens, will not concede much ground to anyone. 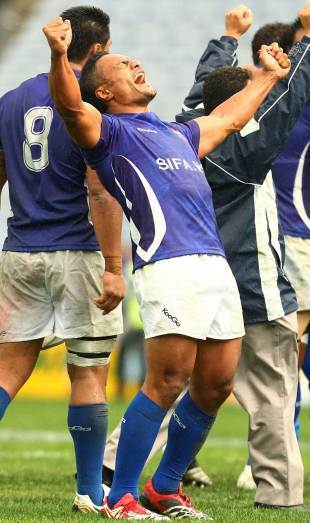 While Samoa have a reputation for their direct, confrontational style, wing David Lemi, at 175cm and 75kg, is one of the smaller players to feature at the tournament, but possesses speed and guile in abundance. South Africa may prove a step too far for Samoa, their match is the Islanders' final fixture, when quarter-final qualification could come down to bonus points in what promises to be one of the tightest pools. Backs: Kahn Fotuali'i, David Lemi, Johhny Leota, Seilala Mapusua, Eliota Sapolu Fuimaono, Tasesa Lavea, Augustino Poluleuligaga, George Pisi, Tusi Pisi, James So'oialo, Jeremy Sua, Sailosi Tagicakibau, Alesana Tuilagi, Paul Williams.